I have seen many great Fn3 layouts using 1/18 and 1/24th vehicles but they look to big or to small when compared to the trains. I have tried to stick to 1/20.3 in all aspects of my scenery despite having never found a vehicle in that scale. Compromise must be made and I have had pretty good luck in 1/20 and occasionally in 1/16 scales. Below is the summary of what I found both new and in the secondary markets. As with figures, what is claimed by the manufacturer is not always correct and does not always fit in or look right. I have also found items from other hobbies that fit and are correctly sized within a couple of scale inches. Is some cases selective compression and manufacturing limitations are a necessary evil. So beauty is in the eye of the beholder and I will take a more forgiving stance than I do with figures by not giving recommendations as none of it is to scale. I own all of the vehicle types listed below and am using them on the layout unless specifically stated otherwise. 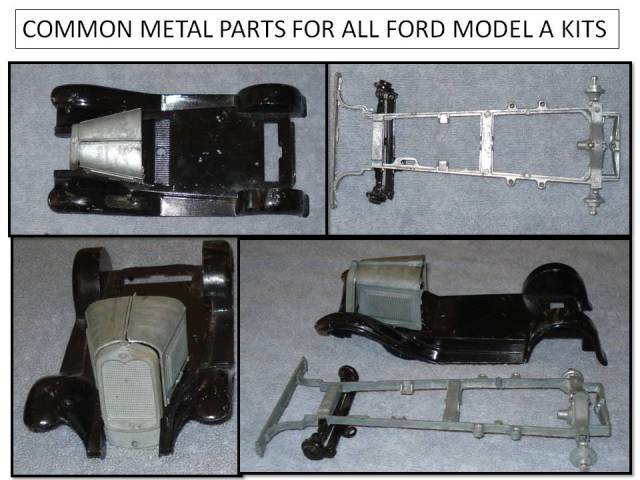 The most prominent source of 1/20 scale models is the Hubley line of metal car kits. 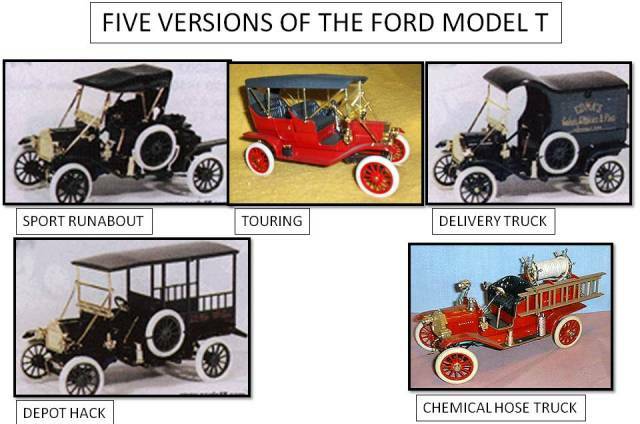 They come in three series: the Ford Model T, the Ford Model A and the 1936 Chevrolet. 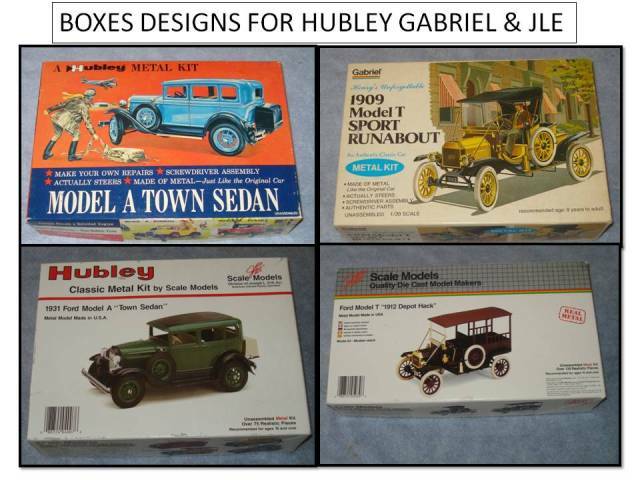 The kits were made first by Hubley then Gabriel and finally by JLE Scale Models. They are all from the same molds and for the most part interchangeable. All are out of production but can be found on auction sites and other secondary markets. There are several versions in each series. 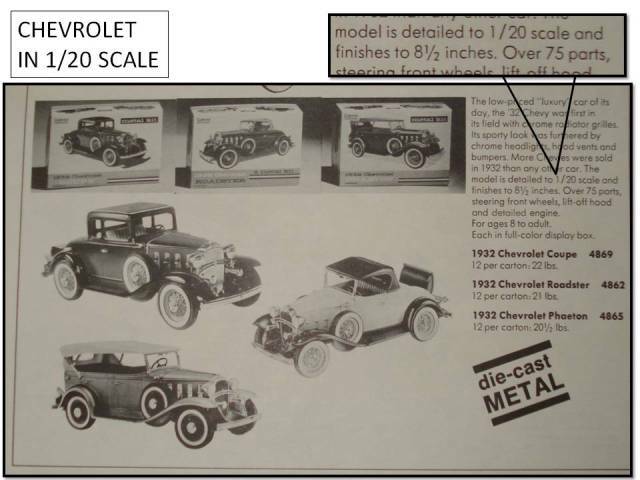 There is also a Duesenburg and Packard series but these are not 1/20 scale. Below are examples of the packaging from all three companies and some advertising flyers for the various kits. All of the Hubley 1/20 vehicles look good and are in use on the layout. The Packard is a 1/22 scale model which is under scale but it looks good next to the other cars because it was such a land-yacht in real life. 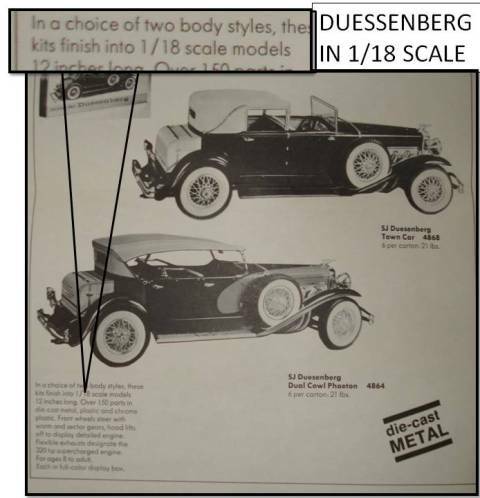 The Duesenberg has the opposite visual effect. At 1/18 it is an over-scale (relative to 1/20.3) model of a very large car. I am not using one of these on the layout. 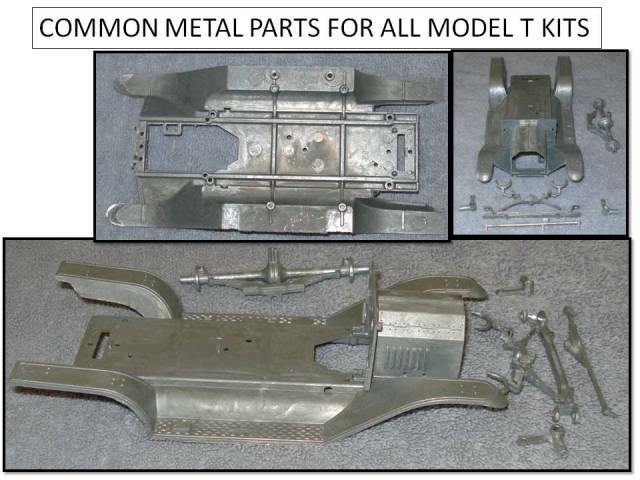 Here is a look at the metal parts of each series. Here is an example of how they compare to 1/18 scale models. 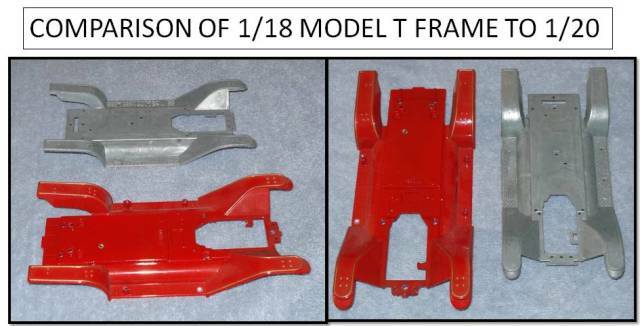 This is a pair of Model T frames. The unpainted one is the Hubley. 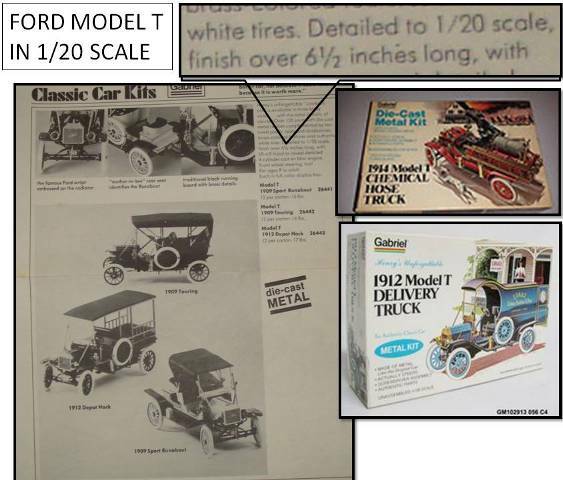 One last note on the Hubley Model T kits. If you do not like the white rubber tires they can be replaced with tires from the Flick Trix toy bicycles as shown below. These fit the Hubley model T rim and pass very well for early black tires. Those listed as “Series 1” are the best fit and appearance there are other upgrade tires (sold as custom accessories) that work. Be careful of what you buy as some of the upgrades can be very knobby or gimmicky looking. I find these by the handful at garage sales and on E-bay. Miscellaneous trivia: the initials in JLE Scale Models stands for Joseph Louis Ertl. These die-cast and plastic collectible cars and trucks are made in France. They are advertised as being 1/19 scale (or 13mm gauge 1) but many people mistake them for 1/18th. The series consists of only two vehicles: 1936 Ford truck and a 1936 roadster. I do not own the roadster. I found the truck to be about 4 scale inches to tall from the ground to the top of the cab otherwise they are almost perfect to 1/20.3. They use a screw together assembly making them easy for repainting, weathering or modification. These vehicles have full interiors including engine detail with working doors and hoods. The trucks are all variations on the same truck bed and come in a wide variety of colors and commercial schemes. Matchbox makes three different vehicle series that are useful to the Fn3 modeler. They are a 1925 Ford Model TT delivery van, Harley Davidson 1937 Knucklehead motorcycle and 1957 GMC panel van. I do not own the panel van as it would be too new for my era but a friend has one and I think it is a very close 1/20 scale. Since the boxes are unmarked sellers often mistakenly list these items as 1/18 or 1/24th. The Model TT van comes in a variety of paint schemes and advertisers. It is often listed as 1/18th scale (there is not one) which is incorrect. Unfortunately Matchbox does not list a scale on the packaging making it easy to confuse with their 1/43 version. The best way to tell it from the smaller version is the presence of the side marker lamp pointed to by the arrow in the photo below. The 1/43 model does not have this detail. I have found it in all of these paint designs. There may be others. 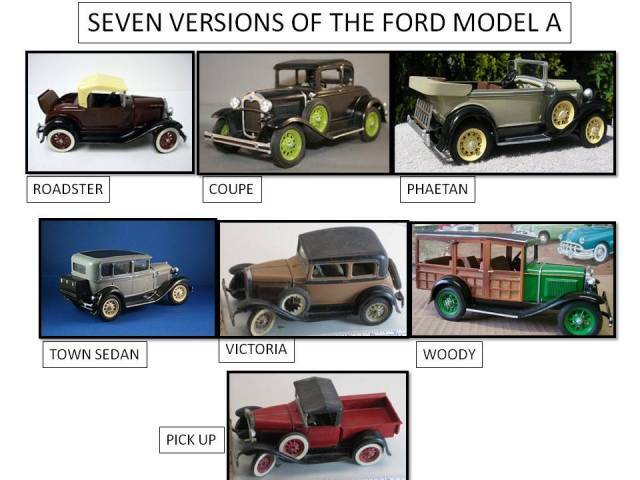 I own the two Ford paint versions. The Harley Davidson is a generic version of the 1937-40 knucklehead simply listed as “Vintage”. With a little paint and detail work it looks good. I have only found it in the twin pack hanger box shown below but I have seen the other bikes in the series as single blister packs so it might have been marketed that way as well. Matchbox makes motorcycles in multiple scales and this item is easily confused with their 1/18th, 1/24th and 1/43 models. Buying one of these out of the package online is a big gamble. The only help I can give is the measurement from the front to rear axle centers should be exactly 3″. The 1957 GMC Panel van…. Well it is beautiful, wish it was a pre-WW II model. I have only found it in two paint schemes. 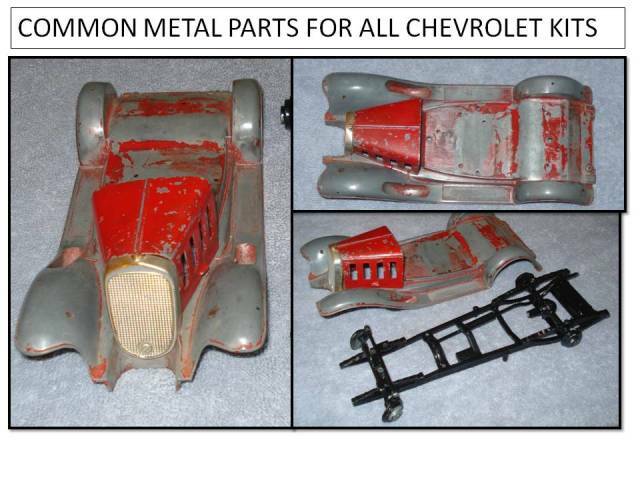 By the way don’t confuse it with the 1937 Panel van which is 1/43 scale. The Bridgestone 10 speed RB -1 is a fairly new bike first marketed in the early 1970s. The Zee Bike is an amalgamation of the RB series. I have found it is a great starting point for earlier bikes since it has full fenders and a rear rack unlike modern 10 speeds. The only major change required to back date it is to replace the curled handlebars with a straight version. This one of three different bikes in the series and the only one usable as the other frame styles are far to distinctively modern. Bburago is an Italian company manufacturing die-cast models of early sports cars. 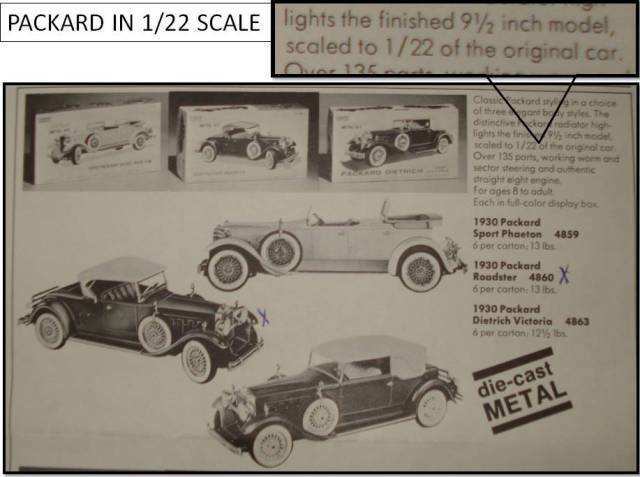 All of them are marked 1/18th or 1/24th except for the 1936 Mercedes Benz 500K Roadster, it comes in a box clearly labeled 1/20. I have only seen it in black and red. It seems large to me but it is a model of a large car. Even though 1/20 figures look good in the seat and next to it, I decided not to use it on the layout. 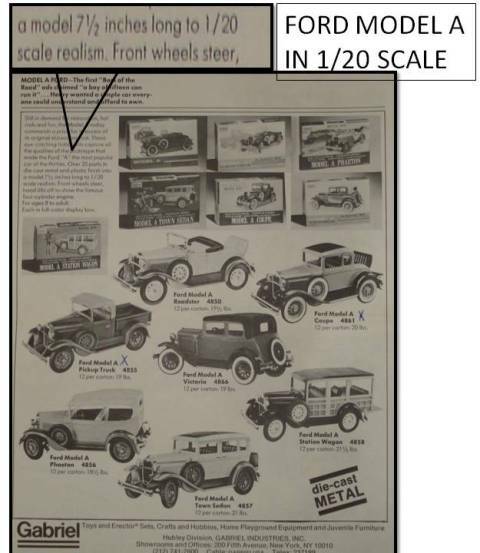 If you buy one be careful not to confuse it with the 1928 Mercedes Roadster in 1/24th scale. The most notable differences are the louvers on the hood and the lack of the folded top behind the seat.